All stained….very beautiful…….many compliments. I think it fits in with the Green Mountain surroundings perfectly. My plans are to order railings for the loft and staircase next year when I finish the inside of the barn. BTW, feel free to use the picture if you’d like. I love my deck and have had nothing but compliments about how beautiful it is and how naturally it fits in the green mountains of Vermont. Thanks James! Vermont’s Green Mountains covered with forests create one of the best backdrops for these Mountain Laurel Handrails. This picture was taken in early spring, showing how beautifully branch balusters play off the barren trees in the landscape. Limbs from the Laurel tree also make a good fit in the four season state because they’re durable and weather well even against harsh elements. The Vermont deck railing spans the width of the house softening the contemporary-style exterior with nature’s touch. Notice the interesting contrast between the vertical balusters on the cozy third floor balcony and the sinuous branch balusters on the second level. 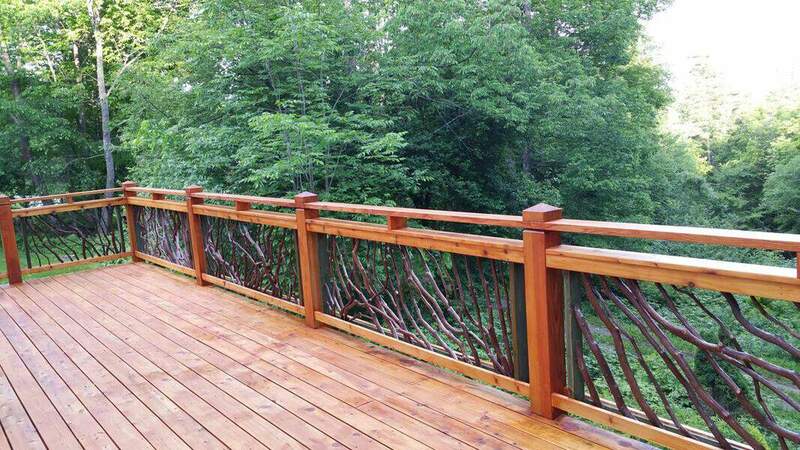 This demonstrates how nicely branch railings mix and match with other railing styles. Above and below are close-up views of the customized handrail. 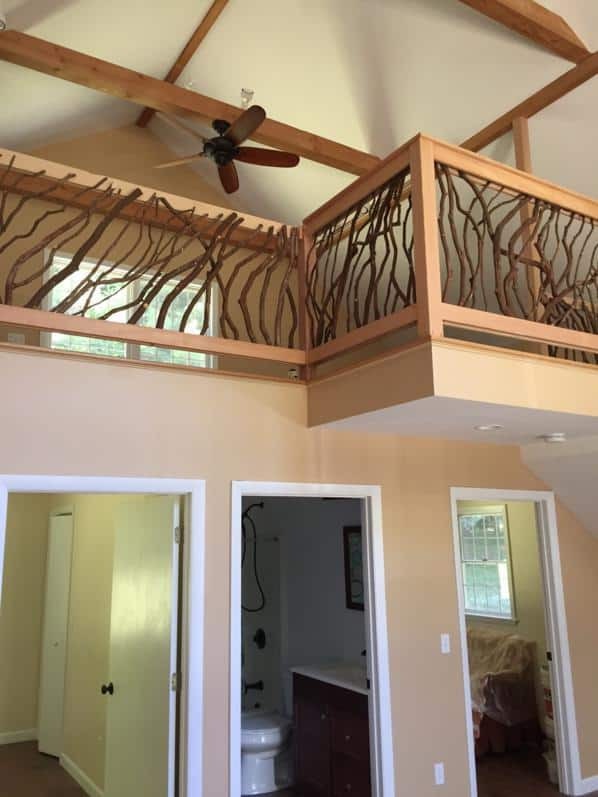 It features an eye-catching double top railing. This provides a distinctive look, in contrast to the typical single handrail. It almost appears as if the arrangement of branches in each section is being framed to stand out like a piece of art. 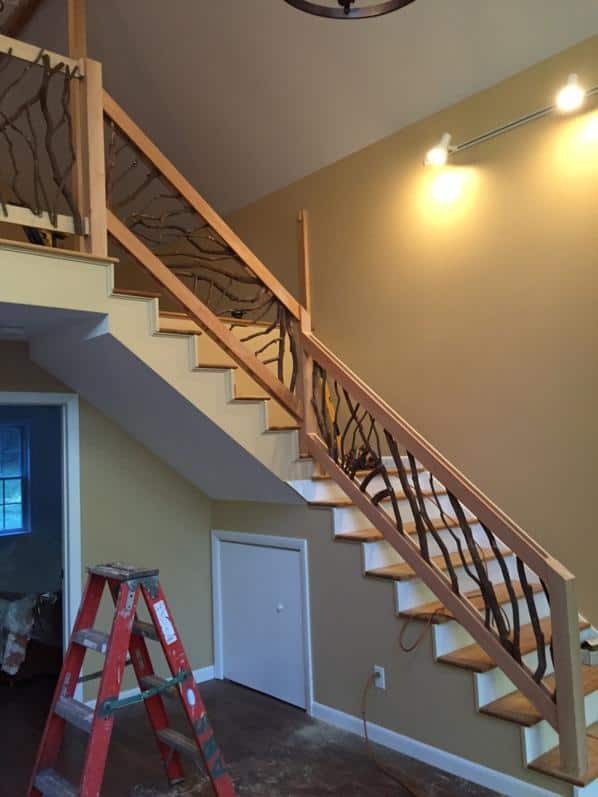 Additionally, this hand-crafted railing is finished with decorative ends on the newel posts, which is another way to customize a post-to-post railing system to fit your style preferences. If you’re brainstorming over new deck ideas for a rustic or county setting, we hope this Vermont deck railing inspires you. 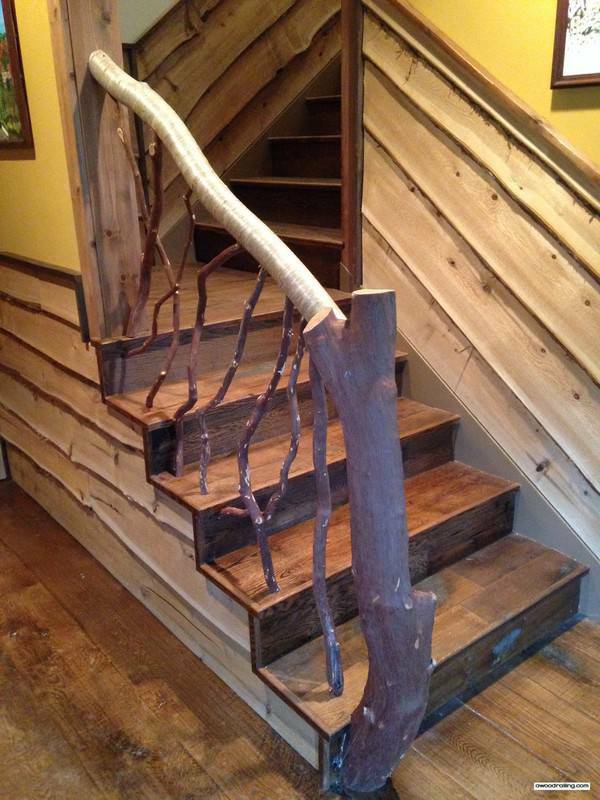 As you can see, branch balusters from the Laurel tree make a natural fit! Hi James, sorry for the delayed response, The homeowners love the railings!! Attached are a few photos. You bought a beautiful new home. 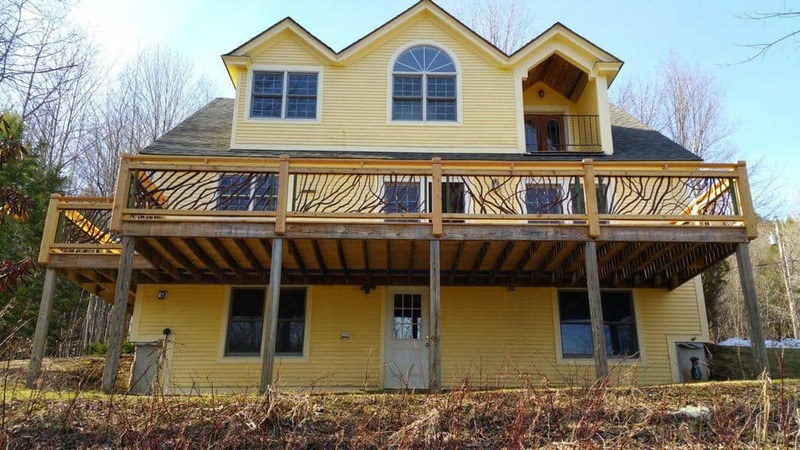 Your home has a beautiful deck overlooking the forest, with stairs that lead down into the spacious backyard. You filled the house with all of your favorite things. You’re really excited! Why do you feel like your house is missing something? Your house and everything in it is an extension of who you are. This is why most people keep their homes clean and free of clutter. This is why they take months to pick out the perfect couch and the perfect lamp with a color of lampshade that offers a nice contrast to the color of the accent wall. And we have to make sure the furniture is arranged Feng Shui to offer the most peaceful and lease chaotic atmosphere in the house. 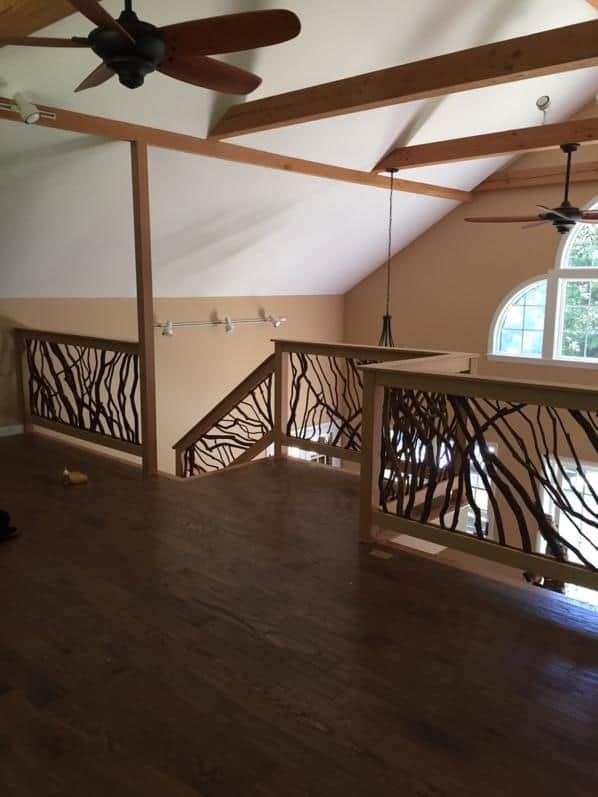 What kind of railings are on the deck? Is the deck or the railings made out of Vermont timber? Were they hand carved by a Master Carpenter? They should be. 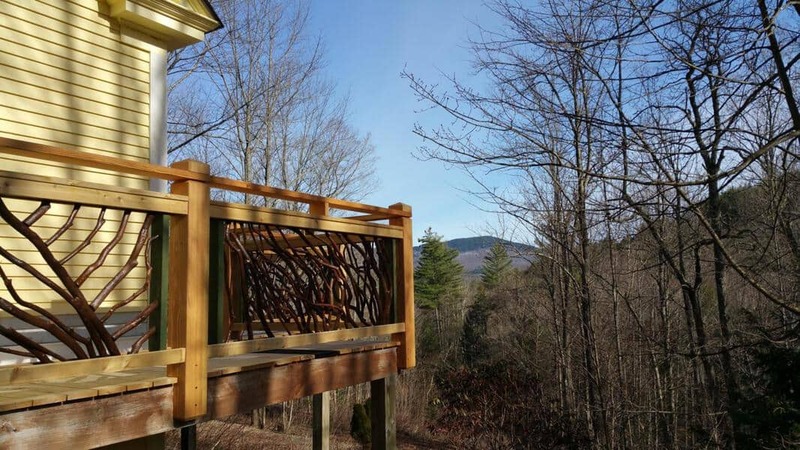 James Pader of Mountain Laurel Handrails has been hand-crafting wooden railings for decks, balconies, and stairs for the last ten years. 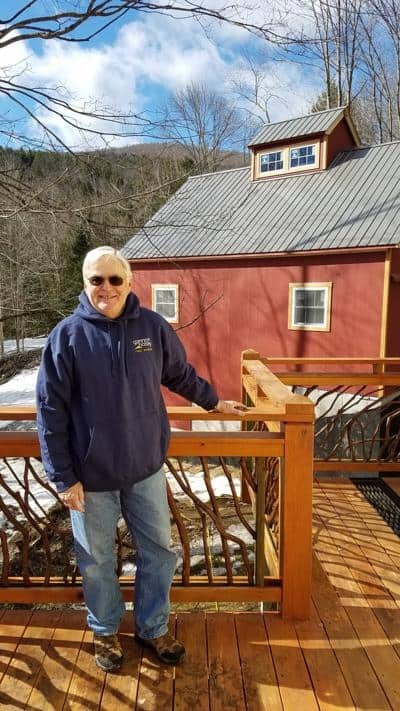 One man has made it his mission to bring artistic expression in homes to a new level with his Vermont timber frame designs. 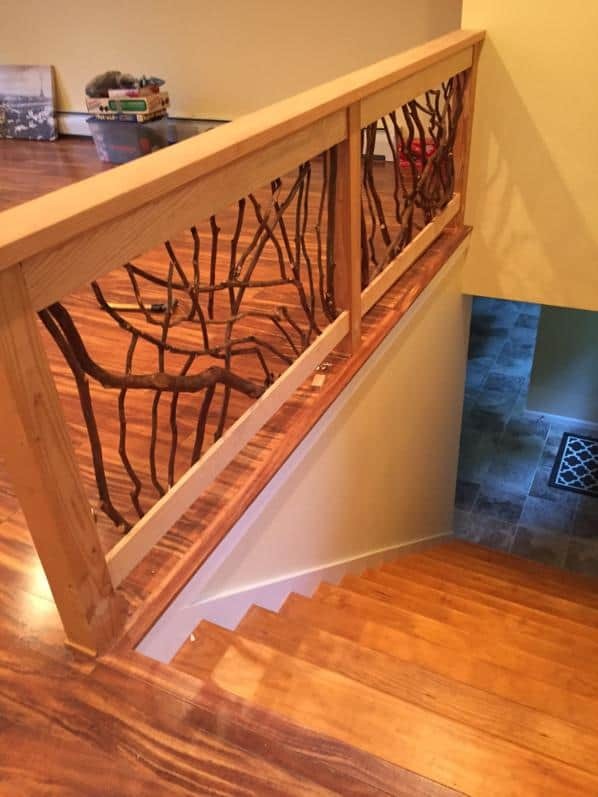 Instead of just a plain set of wood railings for your stairs, why not have James hand carve designs into the sturdy and sweet smelling wood to give your home an extra feeling of wow. Your family and friends will be amazed by the simple beauty of your balcony. James offers photos of completed work along with suggestions for simple renovations on his website. In addition, you will also find a personal bio with James’s mission statement showing how he feels about his work, as well as a special section for potential customers to send him messages and ask him questions about what kind of work he does and what they would like done to their homes. An outdoor deck isn’t just a few board stuck together to give you the added 2 feet of observation height; it’s a place for you, your family and your friends can all enjoy the brilliance of the outdoors with an added sense of comfort and solitude. We know how to build a sturdy, reliable outdoor deck that will last for years. 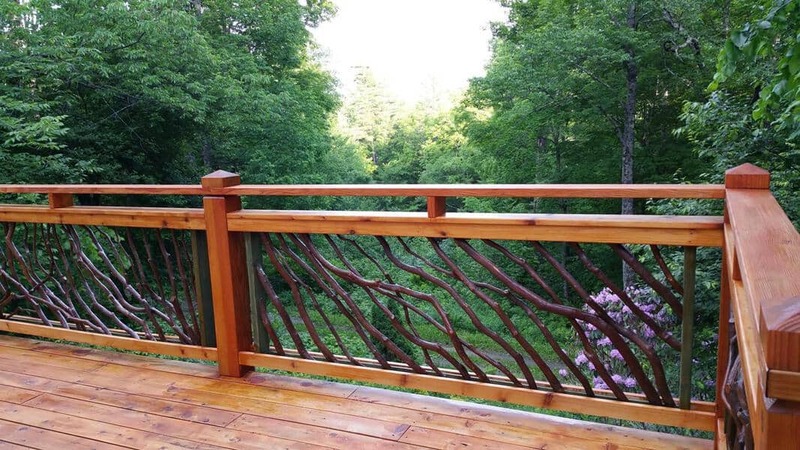 No deck, however, would be complete without an ornate railing to fit the local landscape. 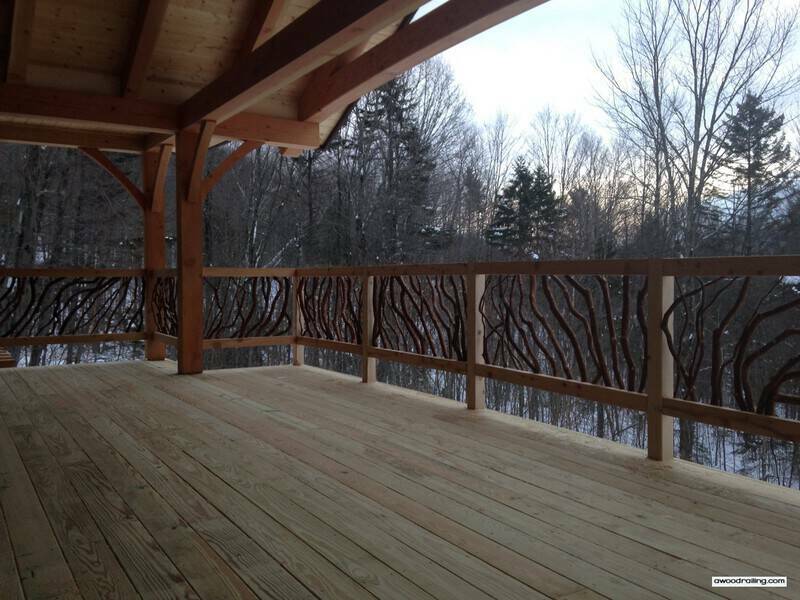 Your guests will be amazed at just how intricate the designs for your brand-new Vermont timber railing look when matched up against the beautiful wilderness of the surrounding area. The Vermont timber design incorporates the aesthetics of wild tree branches strewn together without any constraint to a specific pattern to create a look that is natural and rugged. The branches were shaved of their bark and placed close together either vertically or at an angle, creating a design that is every bit as practical for the purpose it serves as it is beautiful to look at. For the perfect combination of durability and rugged aesthetics, go for the Vermont timber frame deck railing for your outdoor deck. Of course, you don’t have to restrict yourself to outdoor decks when with Vermont timber railing. The design also works very well in many indoor places such as staircase railings and room dividers. 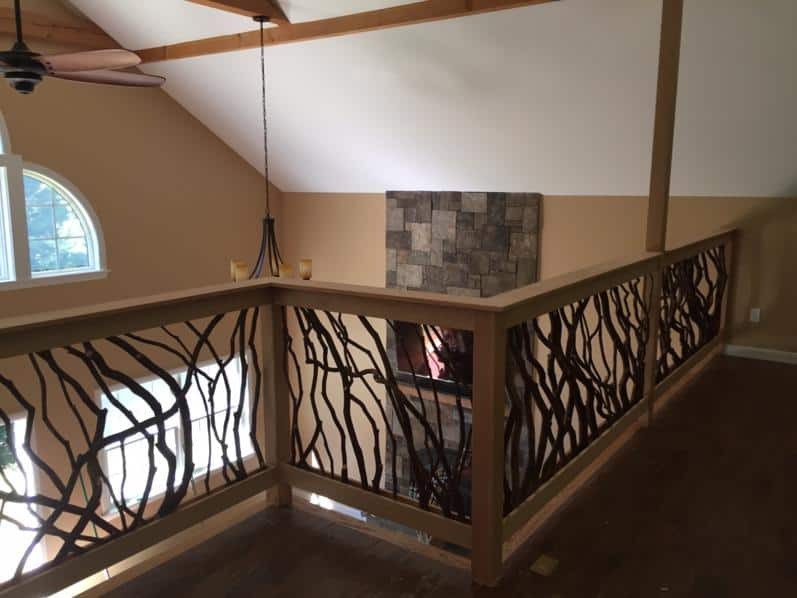 Pretty much anywhere in your house where you would like to make a bold, outdoor enthusiast statement that incorporates all the charms of living in a cabin or lodge, you can use the Vermont timber railing design with outstanding results. 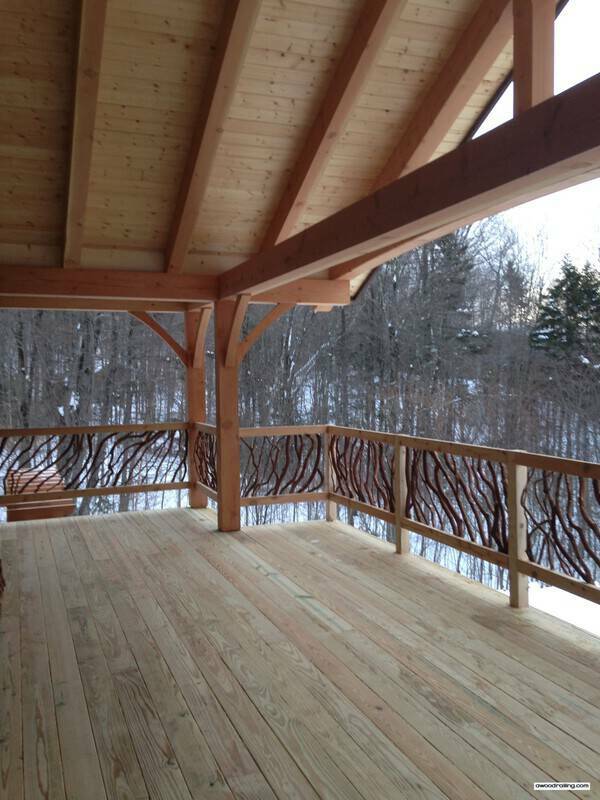 We use only the highest quality Vermont timber to build our rails and decks. Every piece of lumber in the rail frame is precisely measured and cut after it is treated with a basic fire retardant. With expert carpenters like ours on your side, any deck upgrade you are looking to make is a snap. The craftsmanship on every part of the decks that we build, from the foundation to the steps and expert crafted Vermont railing, has an unparalleled level of attention to detail as well as the strength to hold up for as long as any other part of your house. 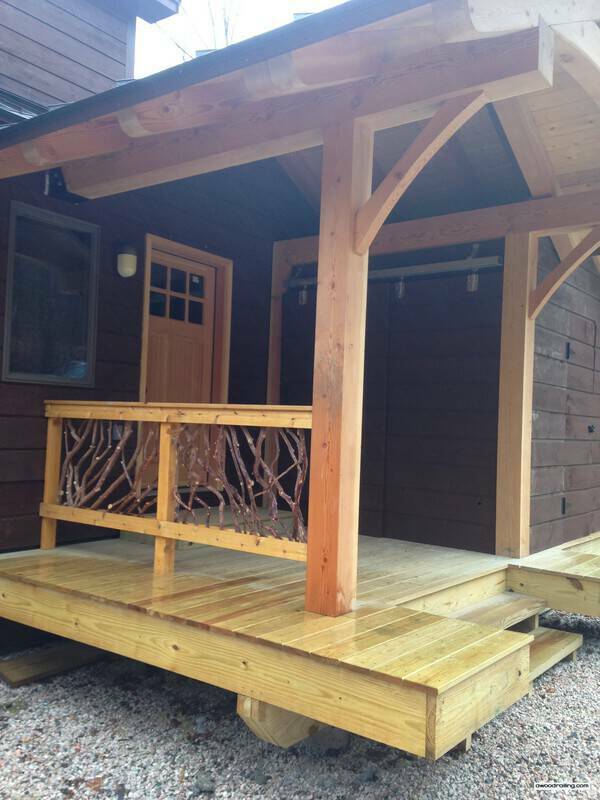 Another plus is that Mountain Laurel Handrails ships all over the United States. The railings come in three separate sections which are easy to assemble upon delivery. Some people order home furnishings based on price and convenience. Some people order home furnishings based on their beauty and quality, home furnishings that will set on lookers slack jawed with appreciation. Appreciation is the key. Beatiful hand crafted wooden railings, accessories that will accentuate your already amazing home. 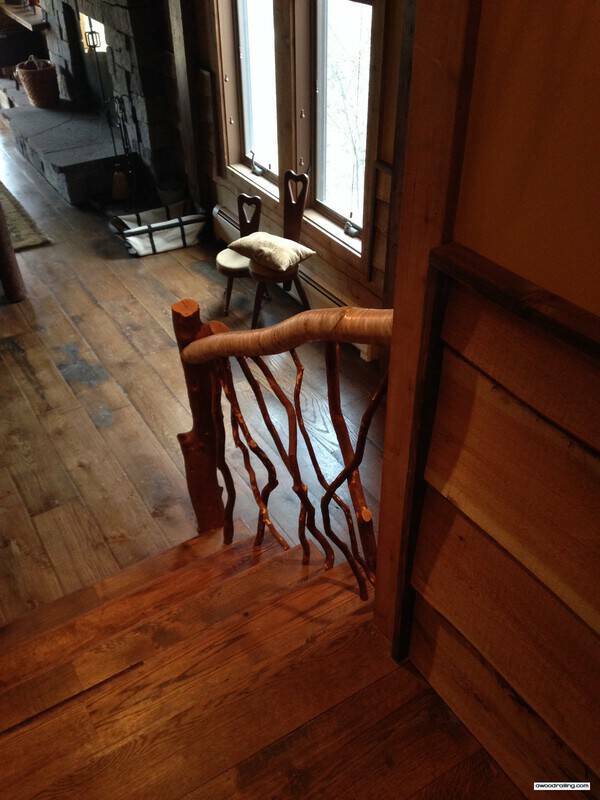 Mountain Laurel Handrails also gives every home that country feeling that only real wood brings to the table. Sturdy, beautiful and sweet smelling. What more could you ask for? Mountain Laurel Handrails is where you want to go to add an element of rustic class to your home. Then, just make yourself a glass of iced tea and sit out on your deck and look out at the world beyond your amazing new hand crafted artistic railings. It’s only a matter of time before all of your neighbors are going to want to know where you got them. While opting for clean lines and clean designs for their house, homeowners add a splash of artistic flair by integrating handrails with interlacing shrub branches. As you’ll see in the pictures below, Laurel railings are an amazing complement to modern and contemporary interior design styles. When it comes to shape and line, a modern home’s interior typically features strong, straight lines. This design principle is quite evident here with the large, linear beams framing the ceiling. The indoor space also displays a strong geometric shape. But then, an unexpected element–curving and weaving balusters–stand out beautifully, while also fitting in perfectly. Mountain Laurel handrails look particularly beautiful as a focal point with a neutral color palette and modern material choices. Modern style homes favor neutral color schemes, such as the beige and white tones shown here. The handrail’s top, bottom and newels also feature a natural stain to match the walls. However, notice how the deep, reddish brown branches really stand out to create the room’s focal point. Their natural color also brings a sense of warmth to a spacious, open floor plan. In addition, the artistically arranged balusters add decoration to an otherwise clean, crisp staircase. Above is a nice example of the use of natural materials in modern design. A natural stone fireplace with its streamlined shape adds a touch of modern rustic to the interior. At the same time, Laurel branch railings pair perfectly while conveying an informal elegance. 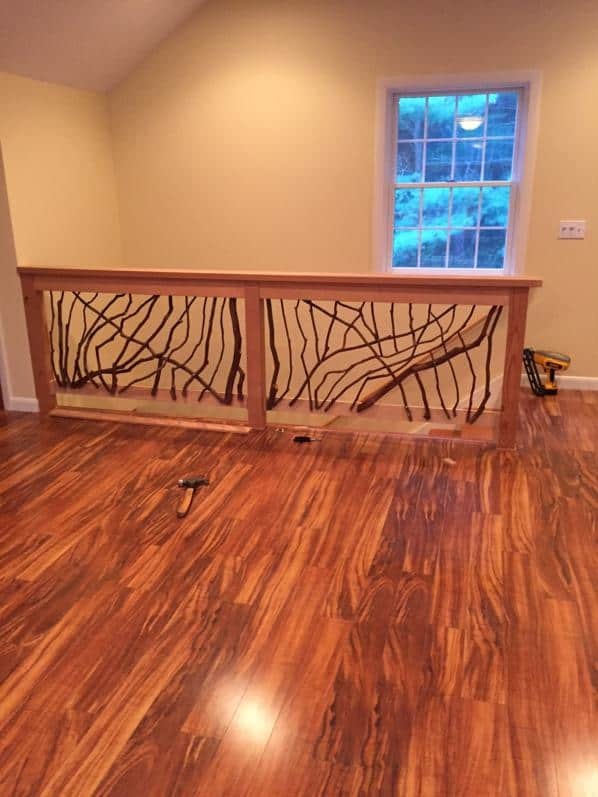 Here, the organic handrails complement smooth and bare hardwood floors. Also notice how the branches in the railing reflect on the trees outside the window. If your home’s style favors clean lines and clean designs, consider natural Mountain Laurel railings. 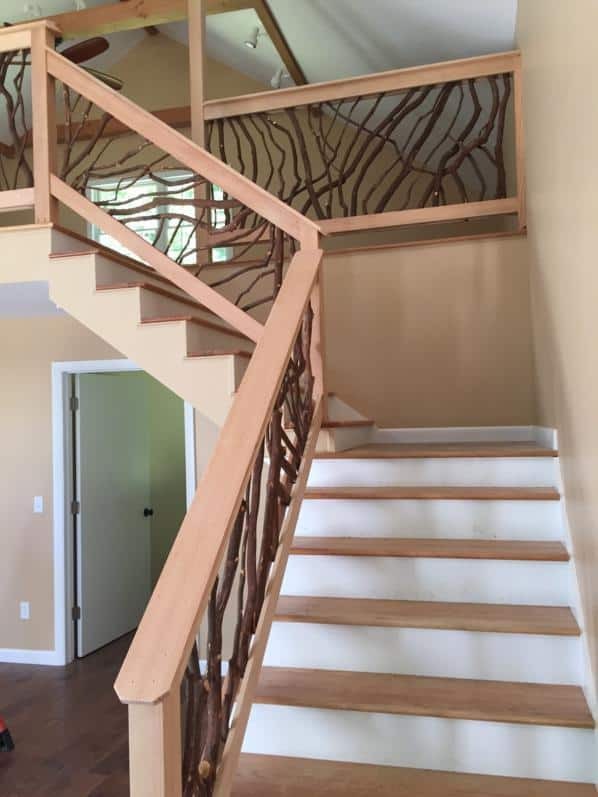 As you can see from the pictures, handrails made from twisting branches offer a fresh interpretation of modern and contemporary interior design.